+ I am an apostle to you – Am I not as free as anyone else? Am I not an apostle? Haven’t I seen Jesus our Lord with my own eyes? Isn’t it because of my work that you belong to the Lord? Even if others think I am not an apostle, I certainly am to you. You yourselves are proof that I am the Lord’s apostle. + All apostles have rights – This is my answer to those who question my authority. Don’t we have the right to live in your homes and share your meals? Don’t we have the right to bring a believing wife with us as the other apostles and the Lord’s brothers do, and as Peter does? Or is it only Barnabas and I who have to work to support ourselves? + All workers have rights – What soldier has to pay his own expenses? What farmer plants a vineyard and doesn’t have the right to eat some of its fruit? What shepherd cares for a flock of sheep and isn’t allowed to drink some of the milk? Am I expressing merely a human opinion, or does the law say the same thing? For the law of Moses says, “You must not muzzle an ox to keep it from eating as it treads out the grain.” Was God thinking only about oxen when he said this? Wasn’t he actually speaking to us? Yes, it was written for us, so that the one who plows and the one who threshes the grain might both expect a share of the harvest. + But I haven’t asked for anything – Since we have planted spiritual seed among you, aren’t we entitled to a harvest of physical food and drink? If you support others who preach to you, shouldn’t we have an even greater right to be supported? But we have never used this right. We would rather put up with anything than be an obstacle to the Good News about Christ. + I preach without charge – Don’t you realize that those who work in the temple get their meals from the offerings brought to the temple? And those who serve at the altar get a share of the sacrificial offerings. In the same way, the Lord ordered that those who preach the Good News should be supported by those who benefit from it. Yet I have never used any of these rights. And I am not writing this to suggest that I want to start now. In fact, I would rather die than lose my right to boast about preaching without charge. Yet preaching the Good News is not something I can boast about. I am compelled by God to do it. How terrible for me if I didn’t preach the Good News! + My preaching is a sacred trust – If I were doing this on my own initiative, I would deserve payment. But I have no choice, for God has given me this sacred trust. What then is my pay? It is the opportunity to preach the Good News without charging anyone. 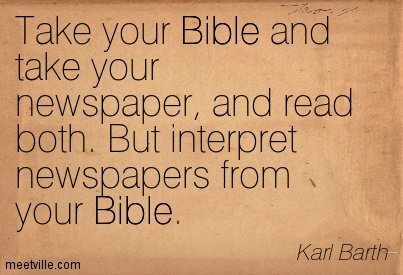 That’s why I never demand my rights when I preach the Good News. + My purpose is to bring many to Christ – Even though I am a free man with no master, I have become a slave to all people to bring many to Christ. When I was with the Jews, I lived like a Jew to bring the Jews to Christ. When I was with those who follow the Jewish law, I too lived under that law. Even though I am not subject to the law, I did this so I could bring to Christ those who are under the law. When I am with the Gentiles who do not follow the Jewish law, I too live apart from that law so I can bring them to Christ. But I do not ignore the law of God; I obey the law of Christ. 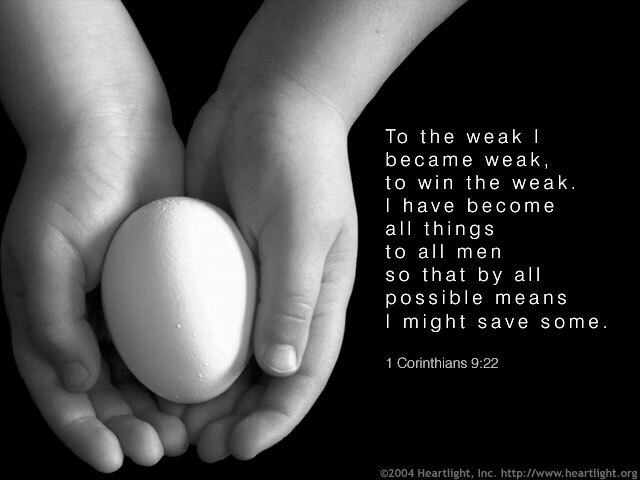 + I try to find common ground to spread the Good News – When I am with those who are weak, I share their weakness, for I want to bring the weak to Christ. Yes, I try to find common ground with everyone, doing everything I can to save some. I do everything to spread the Good News and share in its blessings. + I live for an eternal purpose – Don’t you realize that in a race everyone runs, but only one person gets the prize? So run to win! All athletes are disciplined in their training. They do it to win a prize that will fade away, but we do it for an eternal prize. So I run with purpose in every step. I am not just shadowboxing. I discipline my body like an athlete, training it to do what it should. Otherwise, I fear that after preaching to others I myself might be disqualified. + God gave our ancestors spiritual food – I don’t want you to forget, dear brothers and sisters, about our ancestors in the wilderness long ago. All of them were guided by a cloud that moved ahead of them, and all of them walked through the sea on dry ground. In the cloud and in the sea, all of them were baptized as followers of Moses. All of them ate the same spiritual food, and all of them drank the same spiritual water. For they drank from the spiritual rock that traveled with them, and that rock was Christ. Yet God was not pleased with most of them, and their bodies were scattered in the wilderness. + Do not crave evil things– These things happened as a warning to us, so that we would not crave evil things as they did, or worship idols as some of them did. As the Scriptures say, “The people celebrated with feasting and drinking, and they indulged in pagan revelry.” And we must not engage in sexual immorality as some of them did, causing 23,000 of them to die in one day. + Do not test Christ – Nor should we put Christ to the test, as some of them did and then died from snakebites. And don’t grumble as some of them did, and then were destroyed by the angel of death. These things happened to them as examples for us. They were written down to warn us who live at the end of the age. + Be careful and trust God – If you think you are standing strong, be careful not to fall. The temptations in your life are no different from what others experience. And God is faithful. He will not allow the temptation to be more than you can stand. When you are tempted, he will show you a way out so that you can endure. + We share the blood and body of Christ – So, my dear friends, flee from the worship of idols. You are reasonable people. Decide for yourselves if what I am saying is true. When we bless the cup at the Lord’s Table, aren’t we sharing in the blood of Christ? And when we break the bread, aren’t we sharing in the body of Christ? And though we are many, we all eat from one loaf of bread, showing that we are one body. Think about the people of Israel. Weren’t they united by eating the sacrifices at the altar? + Do not indulge evil – What am I trying to say? Am I saying that food offered to idols has some significance, or that idols are real gods? No, not at all. I am saying that these sacrifices are offered to demons, not to God. And I don’t want you to participate with demons. You cannot drink from the cup of the Lord and from the cup of demons, too. You cannot eat at the Lord’s Table and at the table of demons, too. What? Do we dare to rouse the Lord’s jealousy? Do you think we are stronger than he is? + Restrain your appetites – You say, “I am allowed to do anything”—but not everything is good for you. You say, “I am allowed to do anything”—but not everything is beneficial. Don’t be concerned for your own good but for the good of others. + Be considerate and conscientious – If someone who isn’t a believer asks you home for dinner, accept the invitation if you want to. Eat whatever is offered to you without raising questions of conscience. (But suppose someone tells you, “This meat was offered to an idol.” Don’t eat it, out of consideration for the conscience of the one who told you. It might not be a matter of conscience for you, but it is for the other person.) For why should my freedom be limited by what someone else thinks? If I can thank God for the food and enjoy it, why should I be condemned for eating it? + Do everything for God’s glory – So whether you eat or drink, or whatever you do, do it all for the glory of God. Don’t give offense to Jews or Gentiles or the church of God. I, too, try to please everyone in everything I do. I don’t just do what is best for me; I do what is best for others so that many may be saved.